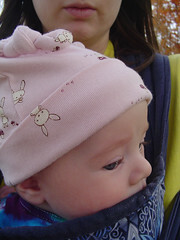 Cute hat, cute baby! She has gorgeous blue eyes. I'll say, it's adorable. Man she is so pretty. She's SO CUTE!! I remember taking pics just like that *last* fall of our walks. You'll cherish these pics for ever.